Several videos released to the Center have clear audio tracks that contain distinct sounds of explosions occurring at the World Trade Center. These audio tracks provide support to the many eyewitness statements referring to explosions occurring when the buildings collapsed. Explosions can be heard at the initiation of the South Tower collapse in the following two videos. The explosions are clear enough at normal volumes, but turning your speaker volume up a bit can help provide a full appreciation of the sound. In the next video, a loud, low-frequency boom can be heard just before the east penthouse of WTC 7 falls. David Chandler will soon be publishing a video that contains a more in depth analysis of this footage, including audio enhancements of the explosion. Several videos also have clear visible explosions that occur above the airplane impact/collapse zone in the South Tower. In the video below, the collapse begins at about the 3:45 mark. 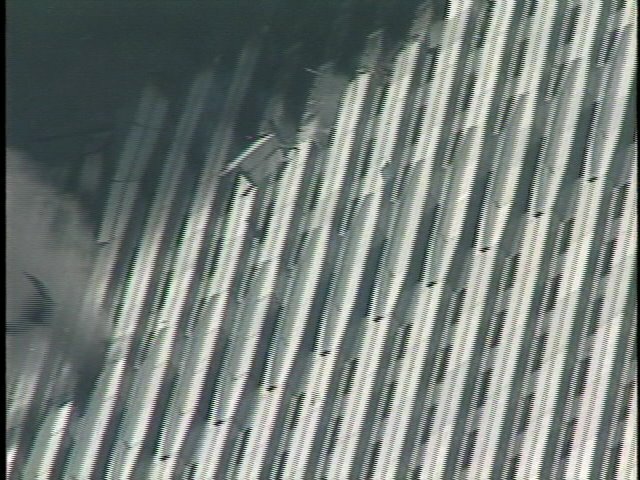 If you watch the corner of the South Tower nearest the camera, at a point about halfway between the airplane impact zone and the top of the building, you will see puffs of smoke and a flash at about the 3:49-3:50 mark. The corner of the building also appears to lose structural support (or “kink”) at this same location. These are the obvious result of explosive charges severing the steel structure at the near corner. In the next video, a similar phenomenon can be seen, but from a different angle and not quite as clearly.